Born with a rare genitic condition, Larsen Syndrome her biological parents forced to place her in an orphanage for handicapped children where she laid for four years without medical treatment while she waited for her forever parents. After raising our children we adopted Shruthi at age 4 she joined our family starting her medical journey. Larsen Syndrome has left Shruthi with deformities of her legs, feet, elbows, hips and spine (severe scoliosis) along with a mild heart defect, hearing and vision loss. She has undergone 36 sedated medical procedures with nine being major surgeries to correct her eyes, knees and feet. Her legs bent backwards but after surgery they now bend normal. “I just want to be like everybody else” says Shruthi. You will never hear her complain and this statement isn’t a complaint but at age 10 she is noticing the difference. Tiny girl at only 40 pounds but her personality is that of a giant and so is her determination! We tell Shruthi she can do anything anybody else can we just have to do it differently and we will find a way. 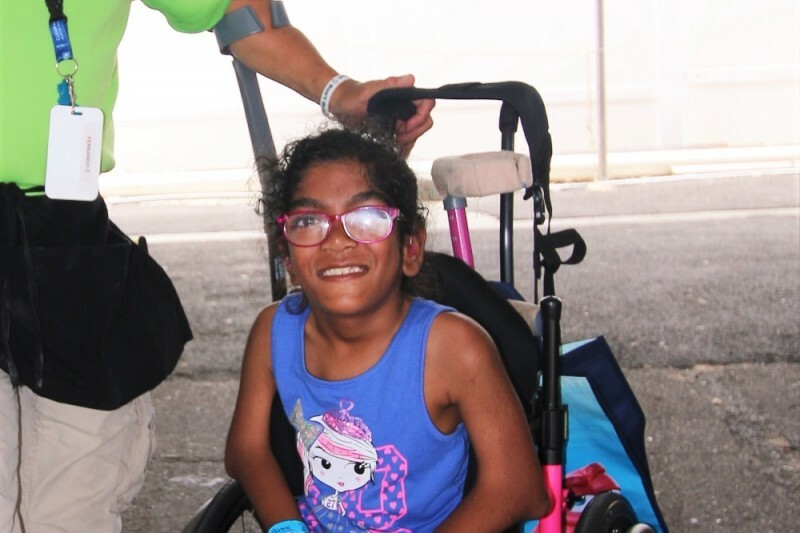 More importantly we encourage Shruthi to be the best she can be regardless if her body won’t cooperate. She isn’t disabled but challenged! All Shruthi wants is to be like other kids who can walk, run, play and be independant but her body won’t let her. Shruthi despite her many challenges she has one goal in life, to be her best! She is always giving hope and joy to those around her. Shruthi is pure joy, gives us hope and inspires us all. She fights through her pain daily, never verbally complaining yet you can see her pain in her face, it doesn’t slow her down a bit. She is full of determination and her will power is unstopable. Pushing herself is who she is. Can’t is a bad word and not a part of Shruthi’s vocabulary. Shruthi says “if I can anybody can! There is more to Shruthi than what is wrong with her tiny body! Shruthi now faces her biggest challenge, Her spine. Scoliosis has gotten to the point she now has to have spinal surgery which will place rods on both sides of her spine. She will have intense therapy for many months after surgery and again have to learn to walk. Surgery is scheduled for September 27, 2016. Transportation up to this point has been a challenge but not as big of a challenge as it will be after surgery. It is getting harder and harder to to lift her and her chair in and out of the non-accessible van just to take her out of the house for appointments and other necessary trips and into the community. We have an unsurmountable amount of faith that God works everything out and we continue to walk in faith. Today is the day that you can help this incredibly determined young girl gain a better life! 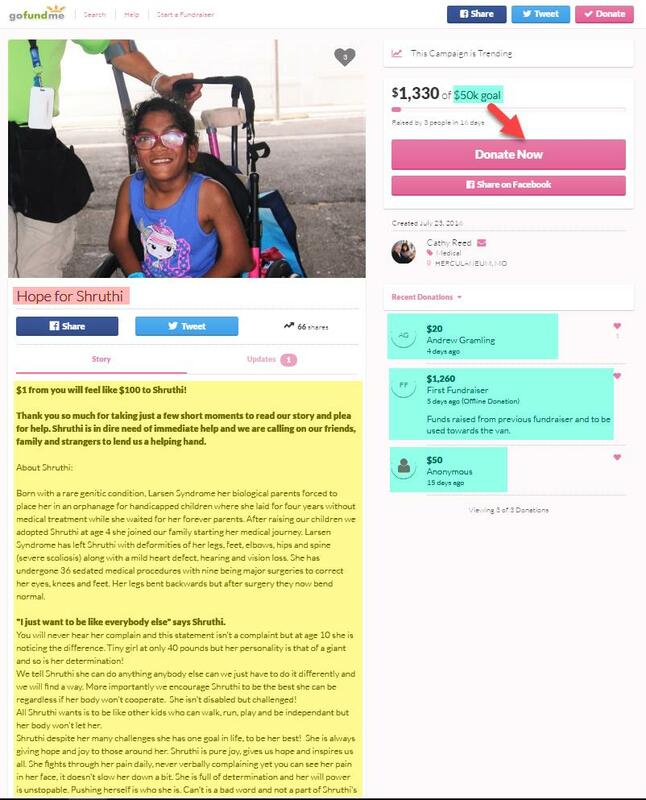 Every dollar raised will go towards obtaining a wheelchair accessible van that will fit her needs. A van that can easily transport her to and from important doctors appointments , surgeries, and therapies. Please if you can donate a few dollars we would be forever grateful, you will be helping change a life. If you cannot donate please share our story with your friends and family within your social circles, perhaps someone you know can help Shruthi! Thank you for your prayers, support and shares! This article was posted in Causes and tagged @teamshruthimom, #independance, #special needs, Larsen Syndrome, Shruthi.